Each new year is a gift. The year gives us 365 opportunities to DECIDE who we will become. Put our dent in the universe. Each opportunity begins with a DECISION. What will you DECIDE to do this year? 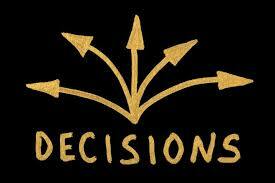 DECISIONS are the fulcrum point of progress. DECISIONS are born from your desire to become more. Your desire morphs into a MINDSET. Your mindset creates a PLAN. Your action sets your life in a NEW DIRECTION. When you set a new direction – your MIND and the UNIVERSE will conspire to help you succeed. You will find new opportunities and new opportunities will find you. The moment you move on a course of action, providence moves with you. This serendipity only happens after you make a decision. You will find energy and resources that you did not know you possess. Your Ultimate Decision is having the COURAGE to make one. Keeping the status quo is AVERAGE. Making a DECISION to become more is REMARKABLE. Blog - Life Unbalanced "Escape Average. Be Remarkable." This entry was posted in Mind Set, New Beginnings, Transitions and tagged 2015, action, average, baby, blog, books, career, cook, courage, debt, decision, Deepak Chopra, faith, family, forgiveness, Joe Ciccarone, legacy, marriage, mind, mindset, new direction, opportunities, plan, remarkable, serendipity, succeed, The Ultimate Decision, Tony Robbins, universe, weight loss, wordpress, write. Bookmark the permalink.